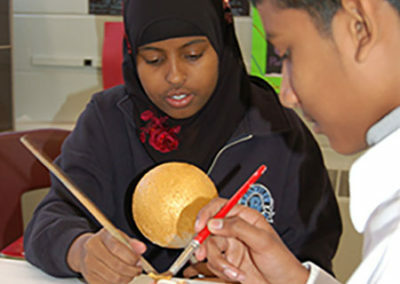 On June 11, 2008, the Art Gallery of York University (AGYU) in partnership with Destination Arts screened Architecture of the Imagination, a program of new video works by twenty-six grade eight students from Brookview Middle School to an audience of over 200 people. The screening at York University’s new state-of-the-art Price Family cinema marked the culmination of a four month long multidisciplinary arts program inspired by Saskia Olde Wolbers’ exhibition. Architecture of the Imagination was facilitated by a team of artists and educators including Allyson Adley, Education Assistant at the Art Gallery of York University, Kathleen Gould Lundy, Coordinator of Destination Arts – A Joint Initiative of the Faculty of Education and Fine Arts, Carolyn Williams, Language Arts Teacher, Brookview Middle School, renowned dub poet Michael St. George, accomplished sculptor and installation artist Bruno Billio, emerging documentary filmmaker Sarah Sharkey Pearce, and acclaimed video artist and editor Aleesa Cohene. Saskia Olde Wolbers’ exhibition and artistic practice provided the creative framework and point of departure as students embarked on the set design process, producing sculpture and creating miniature sets that would serve as the visual backdrop for their video work. Olde Wolbers, a Dutch artist resident in London, England creates intricately and painstakingly fashioned miniature sets, which are captured on digital video. Evoking mindscapes, the viewer finds him/herself suspended at a liminal juncture somewhere between reality and fantasy. A truly groundbreaking arts education program, Architecture of the Imagination afforded middle school students the unique opportunity of seeing a project through its various stages of development – from its narrative inception, through its visual manifestation in set design, to its dramatic articulation in voice-over recording – leading up to a final synthesis of all art forms in video production and editing.